Scott Hoatson, whose role is played by James Percy in the Minneapolis run of Potted Potter, and Joe Maudsley. Like all good Potterheads, my friends and I dressed up in our house colors for Potted Potter, and even though I brought a large stuffed animal niffler in my bag, they still sat by me. I was surprised that there were few if any wizard robes in the audience, but perhaps we just came on a more muggle-crowded night. The show runs through March 10 at Pantages Theatre, so I hope people get more and more adventurous with the outfits because—as the two performers James Percy and Joseph Maudsley said—the show is meant to be fun, so have fun with it. 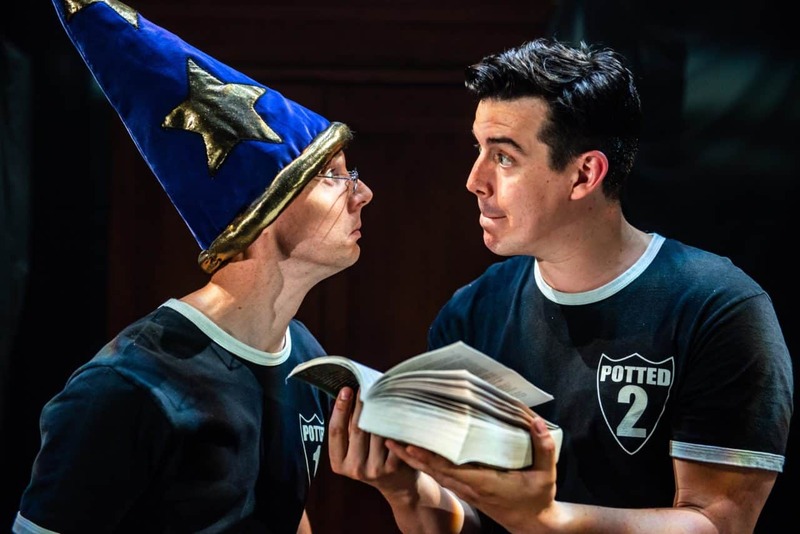 Potted Potter: The Unathorised—you can tell the creators, Daniel Clarkson and Jefferson Turner are British by how they spell—Harry Experience, a Parody by Dan and Jeff is not A Very Potter Musical, nor is it trying to be. Instead, Potted Potter is a two-person comedy show where our performers recap all seven Harry Potter books in 70 minutes with an impressive amount of gusto (and Broadway actors! And inconceivable sets!). A good chunk of the jokes are obvious, especially for the first half of the series, but when you hear all of the young Harry Potter fans in the audience laughing, you can’t help but smile. Like all comedy acts, if it has an audience that’s working with the performers, everything is more mirthful. And so it was for this. The funniest parts were when Maudsley and Percy were making on-the-spot jokes or doing antics that made the other pause to chuckle, a bit of a loosening up from the script. I will also say this for them—they definitely knew how to make the most out of audience members who were willing to put themselves out there. For four 20-some women of varying Harry Potter fanaticism (one has bought season passes for Universal Studio multiple times and could fact check the entire show; one had seen and read the series but somehow didn’t have the desire to take the Pottermore sorting quiz until the night before), we weren’t rolling on the floor in fits of laughter. But we did laugh, and as an excuse to hit up Crave’s great happy hour deals and spend a night together, Potted Potter was more than welcome.